Do you need an easy way to track the hours your employees work every week? Use the printable weekly time sheet featured here to keep track of weekly hours, overtime, start times and end times. You can download the printable weekly time sheet right now for free courtesy of MyExcelTemplates.com! With this printable weekly time sheet template, keeping track of the hours your employees work every week will be a breeze. The time sheet comes in the form of a Microsoft Word document, so it’s incredibly quick and easy to edit and customize. The first step in filling out the time sheet is to add the name of your business or company in the top corner. You can also add your company slogan if applicable. Next, add the employee’s name, employee’s number, the department in which the employee works, their title, status and the name of their supervisor. Hours worked can be separated into regular hours and overtime, simplifying payroll and saving time. 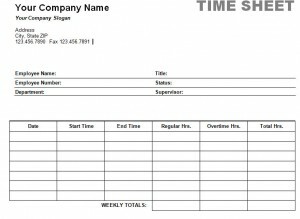 No matter what industry your company is part of, this time sheet template will help you track your employees’ time, so you know when they worked, and how much. Additionally, the timesheet is designed for easy printing, so you’ll never have to adjust or reformat it. Like many of our templates, it can be customized with company logo for a more professional appearance. The final step in filling out the printable weekly time sheet is to have both the employee and supervisor sign and date the document once all the hours worked have been added. This printable weekly time sheet template can go a long way toward simplifying your business. We also have many other time sheets, spreadsheets and templates that most business owners will find useful, so take a moment to browse through our website. We are constantly updating with new templates and calculators for home and business, and you never know what you’ll find. Help us get the word out about our site by posting about this template on Facebook or Google Plus! I will create one soon and email it to you! Sorry for the delay!